Tour Auto D3: Clermont Ferrand-Toulouse. As the runners race south around the extinct volcanoes of Clermont Ferrand we catch up with the competition. After a strong start, the group of Cobras at the top has started to thin out as the overall lead is taken, if not quite consolidated yet, by a Jaguar E-Type. 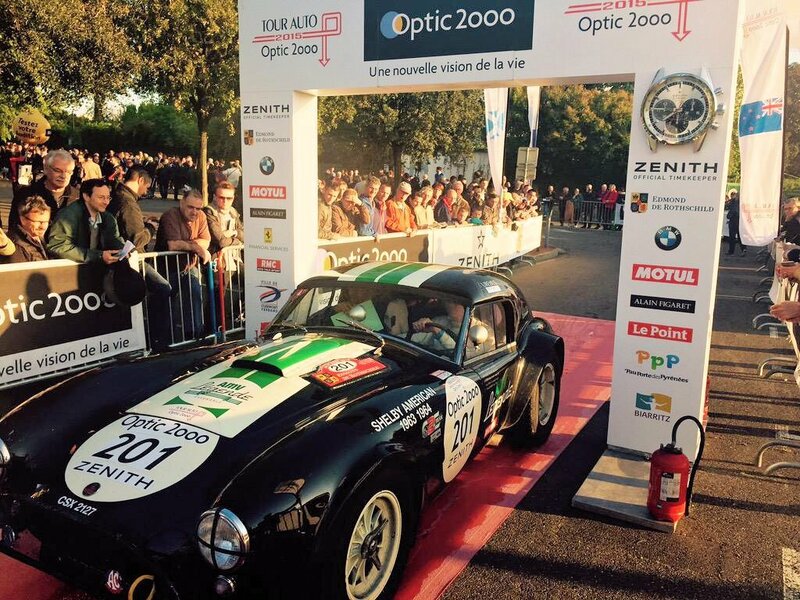 The 1963 Shelby Cobra 289 of second placed overall Ludovic Caron and Charles de Villaucourt at the finish in Toulouse. 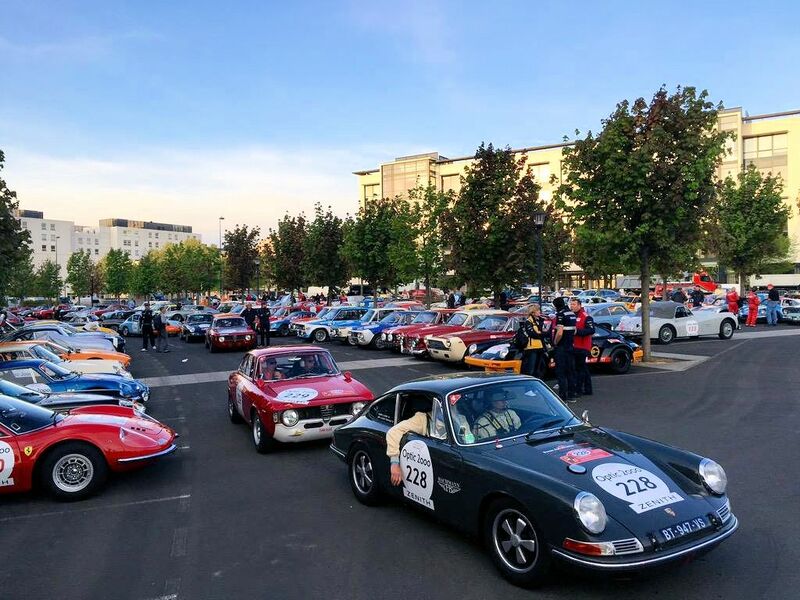 Today is the second longest leg at 463km between Clermont Ferrand and Toulouse with two special stages, lunch at the Domaine de la Goudalie and timed laps of the Circuit d’Albi. In general, the route is much more on the beaten track than yesterday’s tiny back roads (except for one particularly intriguing stretch, the D317 between Saint-Jacques-des-Blats and Mandailles-Saint-Julien). Having said that, there aren’t many ways through the Chaine des Puys, the 40km long string of dormant volcanoes south west of Clermont Ferrand where the cars started this morning. From there it’s a gentle descent down from the Massif Central through Aurillac, Rodez and Albi. Three days in and the competition is starting to take shape. It’s good time to recap events at the sharp end. So far the Shelby Cobra 289s are making pretty much all the running, taking four of the top five positions in the overall standings after the first day. Ludovic Caron and Charles de Villaucourt lead second placed Jean Pierre Lajournade and Christophe Bouchet (in a Jaguar E-Type 3.8) by 13s. 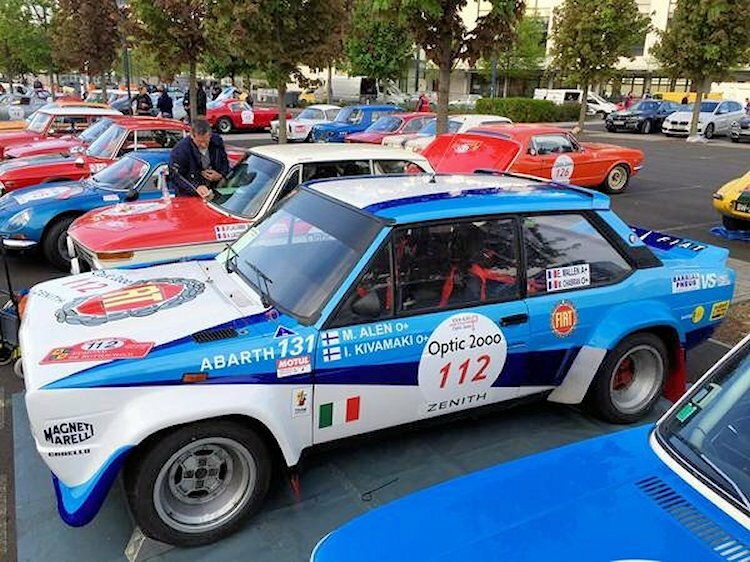 For the GHI class, for cars built 1966-81, in the G1 + G2 section Arnaud Gauduel and Alexandre Delaye in a BMW 2800 CS are 29s ahead of Lucien Guitteny and Jean-Francois Mace in an Alfa Romeo 1750GTAM, and 35 seconds ahead of Philippe Vandromme and Frederic Vivier in a Ford GT40. In H1, H2 + I, Christophe van Riet and Kristoffer Cartenian in the Porsche 911 RS 3.0 lead Didier Sirgue and Jerome Sirgue’s de Tomaso Pantera by 9s, and third placed Porsche 911 RSR 2.8 of Michel Lecourt and Raymond Narac by 15s. 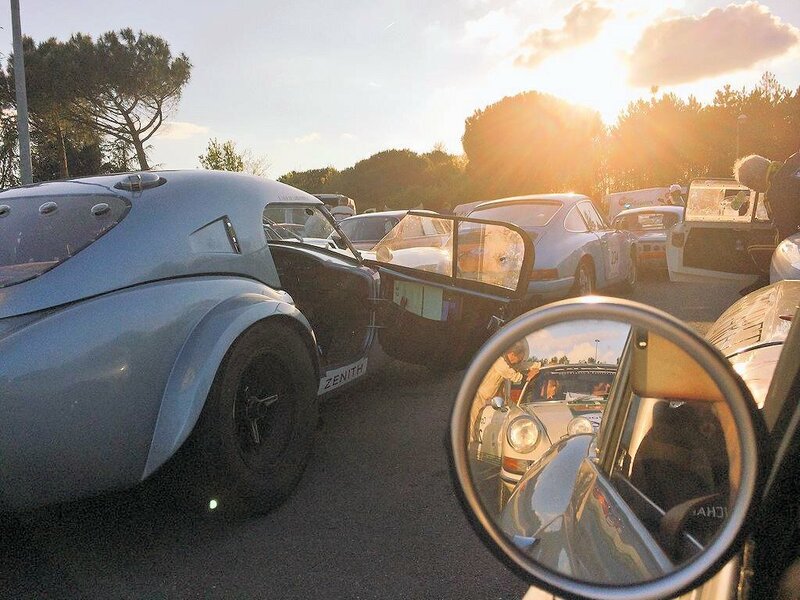 When weighting is applied the overall leaders turn out to be two Porsche 356s followed by two Alfa Romeos, a Giulietta Sprint Veloce and Giulia Sprint Veloce respectively. Frederic Puren and Caroline Bertrand lead Francois Penillard and Mathieu Verlaine by 28s. One Cobra dropped away from the pack today while first place was taken by Jean Pierre Lajournade and Christophe Bouchet’s Jaguar E-Type 3.8. They now lead the Cobra of Ludovic Caron and Charles de Villaucourt by 14s in the overall standings with the Lotus Elan of Damien Kohler and Sylvie Laboisne into fifth, albeit 1m44 behind the pace setters. Meanwhile, in the GHI class, G1 + G2 is still lead by Arnaud Gauduel and Alexandre Delaye in their BMW 2800 CS. They have extended the gap to the second placed Ford GT 40 of Philippe Vandromme and Frederic Vivier to 41s. A further 29s behind are Lucien Guitteny and Jean-Francois Mace in the Alfa Romeo 1750GTAM. Clear blue water is starting to emerge now between the top three and the fourth placed Mini Cooper, 5m12 behind. In H1, H2 + I, Christophe van Riet and Kristoffer Cartenian in the Porsche 911 RS 3.0 stay 9s ahead of Didier Sirgue and Jerome Sirgue’s De Tomaso Pantera. Lecourt and Narac have now dropped behind the third placed Ligier JS 2 DFV. Frederic Puren and Caroline Bertrand in a Porsche 956 stay in the overall lead when performance weighting is applied but Alexis Raoux and Henri Teisserenc in the Alfa Romeo Giuletta Sprint Veloce have now edged into second. Previously second placed Francois Penillard and Mathieu Verlaine, also in a Porsche 956, are now in third. The top duo now also have a pretty hand 1m09 gap over their nearest rivals; 29s separates the next two. Jean Pierre Lajournade and Christophe Bouchet in the Jaguar E-Type 3.8 have eked out their lead over the second placed Cobra 289 of Ludovic Caron and Charles de Villaucourt to 31s in the overall standings. The fourth placed Cobra has dropped away completely leaving Shaun Lynn and Kevin Kivlochan in third, 1m20 behind the leader. The Lotus Elan of Damien Kohler and Sylvie Laboisne moves up into fourth though the gap to the front has now doubled, to 3m05. In the GHI Class, the G1 + G2 two front runners – Arnaud Gauduel and Alexandre Delaye in their BMW 2800 CS, and the Ford GT 40 of Philippe Vandromme and Frederic Vivier – remain in the same positions with a barely-changed 44s between them, but a considerable 7m gap to the rest of the field. Lucien Guitteny and Jean-Francois Mace in the Alfa Romeo 1750GTAM, previously in third, are now nowhere to be seen. It’s now a dead heat at the top of H1, H2 + I between Christophe van Riet and Kristoffer Cartenian in the Porsche 911 RS 3.0 and Didier Sirgue and Jerome Sirgue’s De Tomaso Pantera. The third placed Ligier JS 2 DFV is 1h20 behind with a further gap of 21s to the fourth placed 911 RSR 2.8 of Michel Lecourt and Raymond Narac. The weighted classification is turning into a two-way battle between the Porsche 956 and Alfa Romeo Giulietta Sprint Veloce though Ferderic Puren and Caroline Bertrand have a handy 1m39 advantage over Alexis Raoux and Henri Teisserenc. The third placed 356 of Jean-Francois Penillard and Mathieu Verlaine is now 4m23 behind. 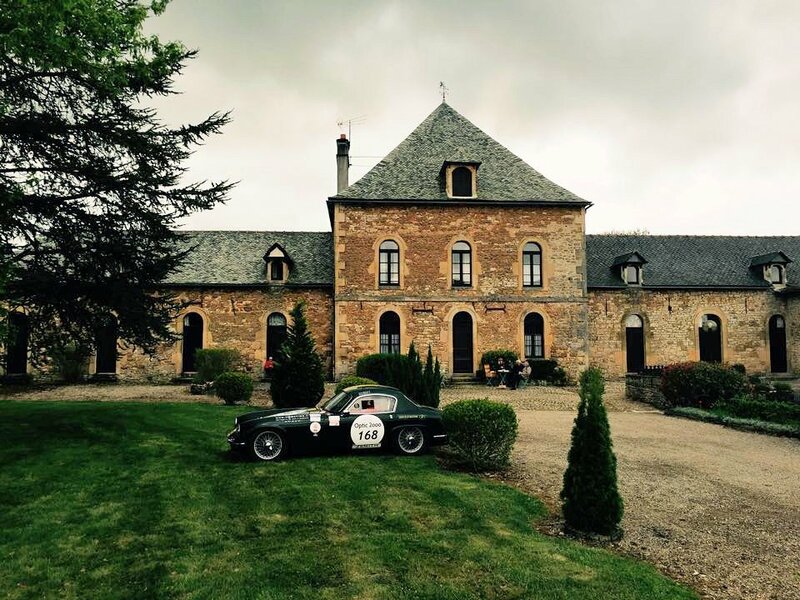 For more information see the Tour Auto website or follow @TourAuto. See Day One Paris-Vichy here, Day Two Vichy-Clermont Ferrand here or Day Four Toulouse-Pau here. 1966 Porsche 911 2.0 of Thierry Lafont and Jean-Claud Penicaud leaving Clermont Ferrand. 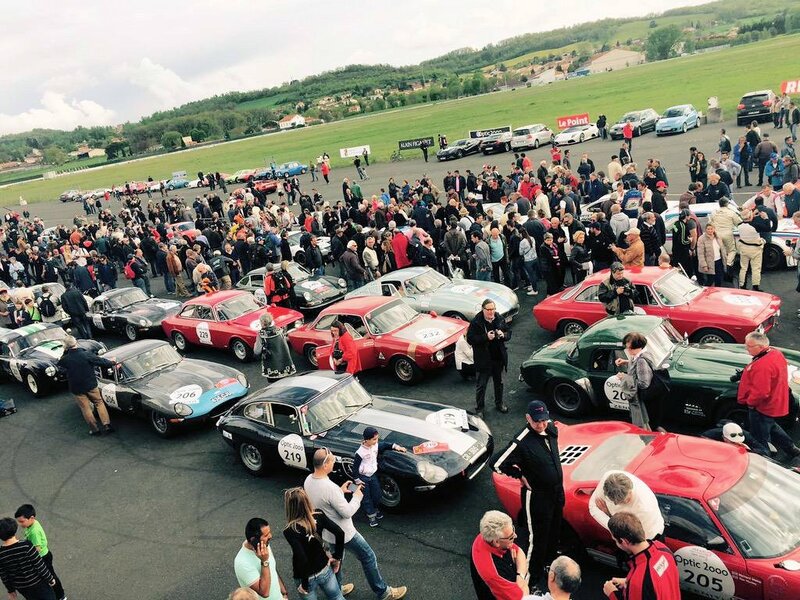 Lining up at Circuit d’Albi. ← Tour Auto D2: Vichy-Clermont Ferrand.